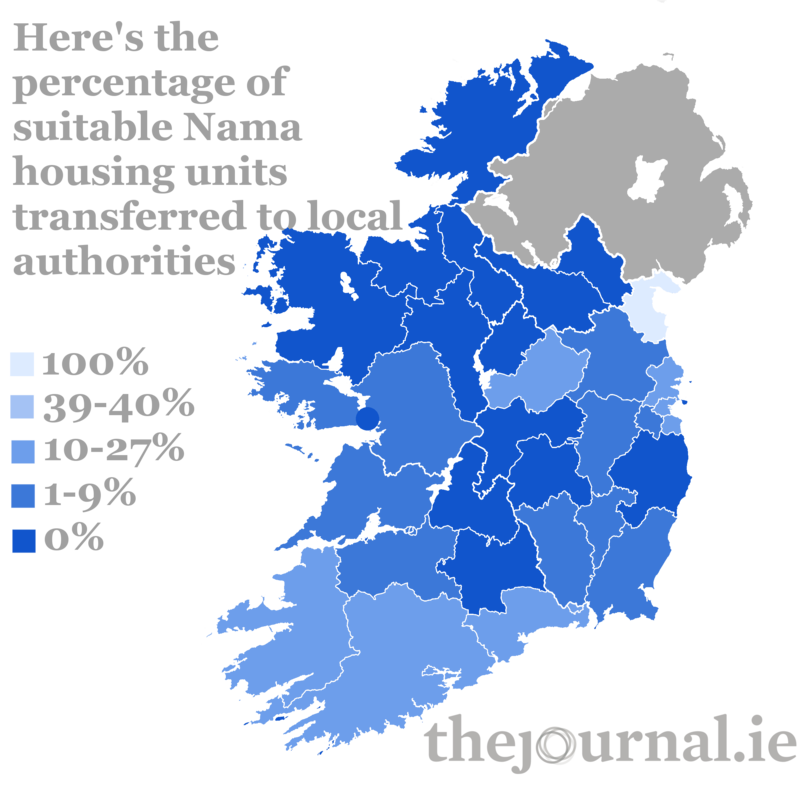 JUST OVER 736 Nama properties have been transferred to local authorities for social housing in the last two years – just 13% of the stock identified by the agency itself as suitable. Replying to a parliamentary question by Fianna Fáil’s Barry Cowen, the Minister for Environment Alan Kelly confirmed that out of 5,294 units identified by Nama as suitable for local authority social housing, just 13% has been delivered. This comes two and half years after the Government promised 2,000 units would be transferred. That would have represented a transfer rate of 36%. Dublin City Council is facing the biggest problem in the country when it comes to social housing demand. Just over 790 units were identified by Nama for transfer to the local authority to help address this problem. The council confirmed the city’s demand is for at least 388 units. However, to date, just 171 unit transfers have been completed. Cork City Council has said their demand is 95 units and they have received just 53 units, despite 419 properties being identified as suitable. Although every county has demand for social housing stock, twelve have not had any units transferred to the local authorities. Louth is the only county to have all units identified transferred over to the council for social housing purposes. Figures released from the Department of the Environment show that there are just under 90,000 people on the social housing waiting list nationwide. Cowen was critical of Nama sitting on the units stating that the delay in transferring much needed housing units is “leading to longer waiting lists and more frustration for families that have nowhere to call home. This is very disappointing to say the least”. He called on the Government to “accelerate” the process due to the high numbers of people on the social housing list. “Special teams should be set up across local authorities to ensure this process starts to bear fruit for families stuck on the social housing lists, some for over 10 years,” he added. “The homes are available for transfer and should be put to good use in providing much needed accommodation for families in need,” he concluded.